If you’re looking at age-restricted 55 communities in the vicinity of The Villages, Florida, you’re hardly alone. 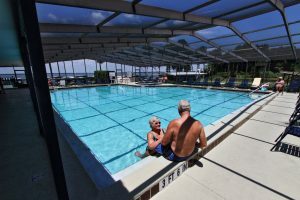 This part of the Sunshine State has zoomed upward in popularity for retirees and semi-retired baby boomers over the past few decades, and that growth has fueled an ever-increasing development of services and activities that appeal to older adults. In addition to an abundance of conveniently located healthcare clinics, the region also offers plenty of opportunities for enjoying boating, fishing, golfing, fine dining, and live concerts by nationally known artists. The very popularity of the region may lead you to believe that there are no affordable communities for ages 55 and up near The Villages, FL. It may surprise you to learn that there’s an affordable active lifestyle community for the 55-and-older set perched on the edge of beautiful Lake Griffin in nearby Leesburg. What’s more, only minutes away from Lake Griffin Harbor, there are public-access golf courses, nature parks, and shopping and dining opportunities that run the gamut from quaint boutiques and bistros to nationally known chain stores and restaurants. And, for those willing to drive a little farther, world-famous beaches and theme parks are an easy day trip away, making Lake Griffin Harbor one of the best-kept secrets among active-lifestyle 55 communities in Central Florida. Why not see for yourself how Lake Griffin Harbor stands out as an affordable option among age 55 communities near The Villages, FL? Contact us today for more information and to schedule a tour.